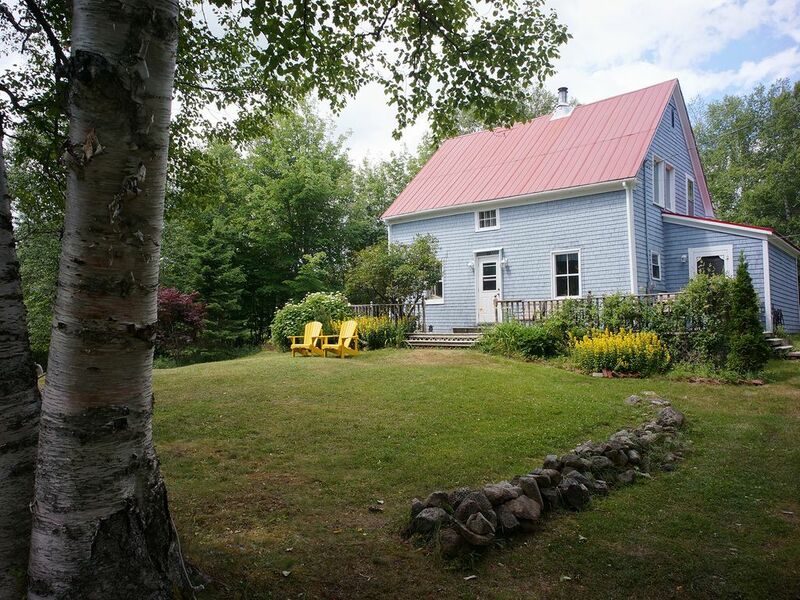 Maggie's is a charming century-old 3-bedroom farmhouse on the Cabot Trail. It is located in Skir Dhu near Wreck Cove on the Atlantic Ocean side of Cape Breton Island. It includes numerous hiking trails, streams and two large ponds yet is close to numerous craft shops, restaurants and beaches. It is ideally located on the Cabot Trail between the Cape Breton Highlands National Park and the Alexander Graham Bell National Historic Site in the town of Baddeck. Much like Maggie's, the community around it is very unique and it makes a great home-base while you visit the neighboring artisans (glass blowing, iron art, leather etc) or hike in the Highlands National Park. The house itself is built on a secluded knoll surrounded by mature silver Birch and sugar Maples. Maggie's has been carefully restored so as to keep its original charm yet is equipped with modern appliances, a fully equipped modern kitchen and high-speed Wifi. Walking trails on the property lead to two large pond, (Smith's Ponds) numerous streams and waterfall. There are many private and public beaches nearby. Kayaking, cafe's, a general store numerous artisan shops and an archery range are all nearby. This part of Cape Breton was settled by Scottish homesteaders between 150 and 200 years ago. The son of the original settler, Angus Smith, built the house from wood cut, milled and planed by hand for his bride Maggie. Since she outlived her husband by many years the property became know as 'Maggie's Place'. We are proud to continue the tradition. Guests will have the use of the entire house, including WIFI, modern appliances and cookware, dishes, linens and towels. Enjoy full use of the yard and trails on the property. There is a gas station nearby. Closest towns are Ingonish and Baddeck. The owners, Uli and Cathy Nikolai, are retired from many years of working in international schools. They live 1 km away and are happy to tell you about hiking trails and other great places to visit along the Cabot Trail if you request their assistance. Staying at Maggie's is more than the usual holiday experience. To quote one of our reviews, "It was like we had stepped back in time and we had this beautiful historic house all to ourselves. This is a home where you can feel not like a tourist but like a local for a while - you feel like you belong." Skir Dhu is in the heart of the what has been described as the "best maintained lobster grounds on the Atlantic". In season and with prior notice you can purchase lobsters and crab from the nearby harbour and government wharf at Little River - 5 minute drive from Maggie's. If you are adventurous, we can help arrange for you to accompany a crew on their very early morning fishing rounds. Maggie's is surrounded by large silver birch and sugar maples set back from the Cabot Trail on a small hill. It is very a very peaceful and private - with no other house nearby nor visible. We have a magnificent view of the Cape Breton Highland from our deck. This mountain range is actually the start of the Appalachian Chain which continues into Quebec and deep into the US. Although the Ocean is visible from the house, it should not be considered as an "Ocean View"
Electric space heaters in bathroom, dining room and upstairs den. 4-burner gas stove with oven and broiler. We offer you an electric drip/ filter coffee maker, a French press and a stove-top espresso maker. We have a 4-person dining table/chairs in the kitchen as well as an 8-person dining table/chairs. Scoregolf has ranked the Cabot Links (90 min drive) and Highland Links (30 min.) as number 1 and 3 public courses in Canada in their 2015 rankings. Both are also listed in top 100 courses in world. The eat-in kitchen has a wood burning fireplace / stove. A large Family Loft upstairs has a sofa bed. The deck has a patio table, and chairs. Skir Dhu is on the world famous Cabot Trail 30 minutes from Ingonish, Cape Breton Highlands National Park, the Highland Links Golf Course and Ingonish Beach. The house is situated on an 85 acre property with two large ponds, hiking trails and old-growth forests. There are numerous opportunities for hiking, beach combing, fishing - both fresh and salt water. Local fishing wharves and beaches are nearby.